U-Pol Reface 2K sprayable metal primer is a highly efficient spray filler for large and irregular surfaces, and is ideal for bare metal and glass fibre substrates. It is high build and easy to sand providing the perfect surface for painting. The product is supplied with its own white hardener. 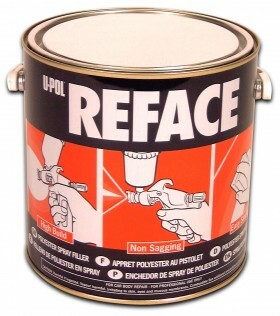 U-POL REFACE can be applied to bare metal polyester putties and bodyfillers and fully cured paint surfaces. Comes in a 1L tin and supplied with Hardener.